In their bid to beat the Guinness World Record, Mark and Denise, The Honeymoon Testers, got married (again!) this morning live on air, officiating the ceremony was Ray D’Arcy from Today FM. 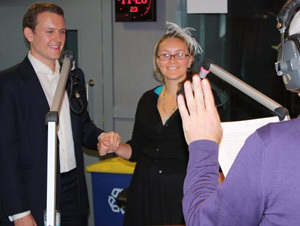 This is the second ‘radio wedding’ for Mark and Denise, who also renewed their vows at the Open FM studios in July. The couple, who has now entered the last few weeks of the Ultimate Job, testing luxury wedding and honeymoon destinations across the globe, is now on the way to Thailand. Lucky things!! !